The Raffaello Hotel’s rooftop cocktail lounge showcases an enviable selection of bourbons, rye, single-malt and blended scotch for patrons to enjoy in the lounge or on the outside patio. There are also a number of creative, whiskey-based drinks, plus monthly scotch tastings. When it comes to cocktail lounges, Aviary’s in a class by itself. It’s the brainchild of molecular gastronomy master Grant Achatz, and the drinks follow a similar culinary philosophy. Bartenders, in fact, are dubbed “sous chefs” and arrive several hours before opening to prep ingredients. The results are magical, with fresh perspectives and seasonal renditions of classic cocktails such as the whiskey-based Manhattan and Old Fashioned. Directly underneath Aviary is The Office, a tiny, invite-only space that seats about 18 guests for drinks and small plates. Both bars boast a massive whiskey list with rare scotches and bourbons as well as progressive whiskey flights. The venues are a short walk or drive from Soho House Chicago. When it opened as ACME Hotel Co.'s lobby lounge in 2013, The Berkshire Room breathed new energy into a room that had long been forgotten. To pay homage to its roots harking back to the 1920s, the highly regarded Chicago whiskey bar kept the original and rare terrazzo composite flooring. It certainly feels like the sort of place highlighted in "The Great Gatsby" or "Boardwalk Empire" as revelers relish in indulgent whiskeys such as Pappy Van Winkle and William Larue Weller. The collection contains more than 200 bourbons, ryes, and scotch. Count on at least a few, whiskey-focused, barrel-finished cocktails to round out the program. Berkshire is based in River North, and centrally located near a number of high-profile hotels. If you're about to take on some country karaoke in front of a room full of strangers, you're going to need all the liquid courage you can muster. Thankfully, this rockin' BBQ joint's got you covered with an extensive whiskey list filled with bourbon and rye favorites. There are also three signature Bub City whiskeys from Four Roses, Knob Creek, and Elijah Craig. The latest addition to Chicago's whiskey-soaked scene is this stunning hotel lounge and restaurant perched on the 20th floor of luxury property Conrad Chicago. Offering premium views of the famed Magnificent Mile shopping district, Baptiste & Bottle is the sort of place you take a high-rolling bourbon or single-malt scotch enthusiast. The collection, of course, is impressive, with cellar selections from Canada, Japan, and Scotland. Guests may order them by tasting flight, glass or bottle. 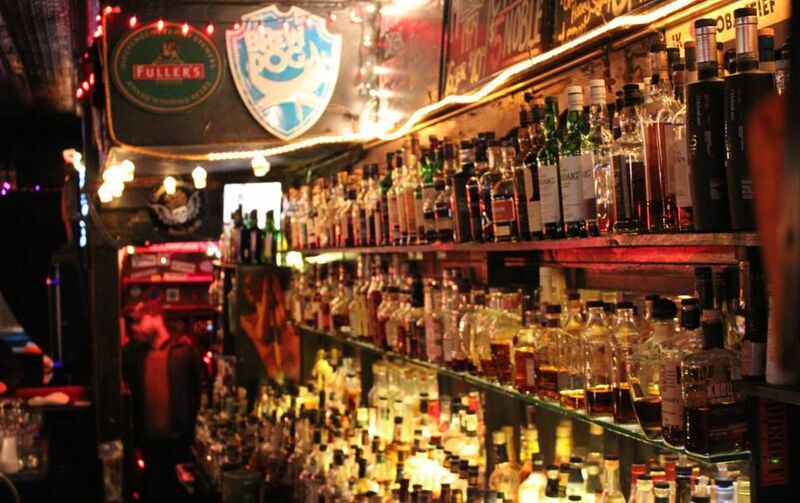 The authentic Scottish pub features the largest collection of single-malt scotch in Chicago. Duke's "whiskey cellar" spotlights all of Scotland's regions, including the Highlands, Island, and Speyside malts. Long before whiskey lounges became trendy, Delilah's was keeping it real in Lincoln Park. Whiskey-obsessed owner Mike Miller is known throughout the world for his expertise on scotch and bourbon, and his well-worn tavern gets regular visits from people all over the globe. In addition to featuring what's considered the largest selection of whiskey in the Midwest, Delilah's spotlights offbeat cult films, punk and goth music. There are also $2 and $3 whiskey specials every night. Delilah's is about a five-minute drive from Hotel Lincoln. Named after the famed Irish author, the Andersonville-based eatery and cocktail lounge pays homage to its Irish heritage in subdued fashion. The real draw is the impressive Irish whiskey selection, which is said to be the largest in the Midwest. LG’s bar staff traveled all over the globe to assemble the more than 300-plus, international whiskey list, but the Irish choices are most prominent. Just in case you find yourself overserved, L&E doubles as a bed and breakfast venue, so you don't have to stumble too far. The award-winning gastropub offers more than 145 whiskeys with 38 obscure and popular labels featured daily for $3 a shot. A hearty selection of original and classic cocktails await you as well, ranging from the Old Fashioned to seasonal drinks with house-made ingredients such as gingerbread dream Roobios syrup, Chai spiced honey syrup and cucumber skin juice. We gained a new respect for this bustling Boystown spot when we discovered its massive whiskey list. Its menu is well-thought out with small-batch and popular collections, plus some great whiskey-based cocktails renamed to reflect the whimsical arcade games spaced throughout the venue. Speaking of which, patrons get the opportunity to play free games (except pinball) when they purchase drinks. Many are of the old-school variety, such as Frogger and Ms. Pac-Man . There is a second location in Andersonville.